Beatrice Behlen, Senior Curator of Fashion and Decorative Arts conducted us to the display called the Pleasure Garden which was mounted last year. She gave an introductory talk explaining the thinking behind the display and some of the problems and rewards the team encountered while mounting it. The team designing the gallery considered other themes such as the coffee house, over all the Pleasure Garden was felt to be the best. The mounting of the figures and the conservation requirements were naturally given deep consideration. A limited amount of light prevents the fading of colours and the rotting of fibres. The lights are set to form a twelve minute sequence going from dark to light which finishes with a short burst of simulated 18th century fireworks. The mannequins have black heads with the outline of features which are based on portraits in the collection. They have articulated wooden hands so that they can wear gloves and hold fans and reticules. Some accessories such as fans are original but the original 18th century hats and gloves are too fragile to be mounted. The gloves are mid 20th century kid gloves and the hats are made by Philip Treacy which gives the display a touch of vitality. Treacy’s hats are inspired by the 18th century and are entirely black. Some were specially made for the display and others originally made for Pop artists, these are on loan to the museum. The cases have mirror at the back to allow the back of garments to be viewed. The mirror is softened to prevent the viewer being distracted by their own reflection. This thematic display is highly successful and is complemented by other fine pieces of dress in the main galleries of the museum. Beatrice next conducted us to the stores where, with the help of two very capable interns, she had laid out a selection of men’s coats from the 1800s and 20th century couture tailored garments. The Museum of London’s whole collection consists of about twenty thousand items of dress, one of the largest collections in the country. It does not include flat textiles. All acquisitions must either have been made in London or known to have been worn in London. A number of the older items came from the studio collections of London history painters. Occasionally items will arrive with their original box and receipt. The provenance and the story of each garment is recorded as far as it is known, with comments from owners. 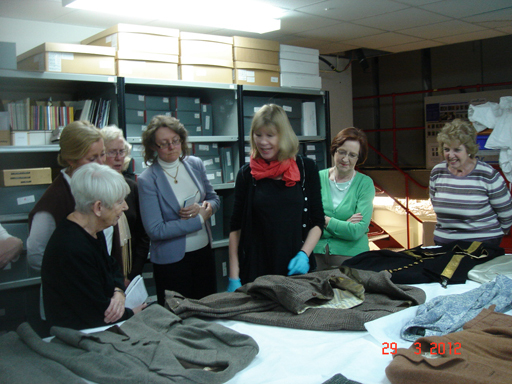 This helps us know how garments were assembled and which accessories were worn with them and for what occasions they were worn. The selection of tailoring included women’s suits with skirts, trousers or breeches, from several well known London houses and men’s clothes ranging from classic leisure wear to a few exuberant examples from the 1970s. Despite these flamboyant pieces, most of the items were understated and in muted colours with superb workmanship and an excellent choice of fabrics. We were privileged to be able to view them closely and to look at the workmanship in detail. 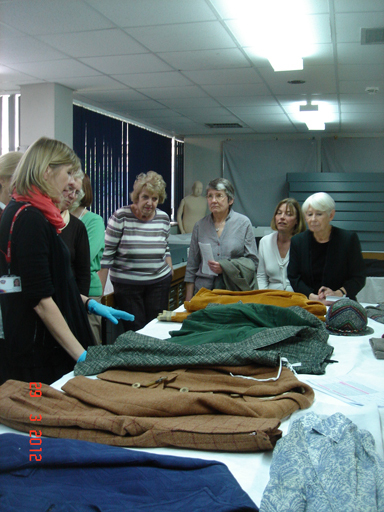 Beatrice spoke informatively about the actual garments and an interesting discussion was generated. This was altogether a very stimulating and enjoyable visit due to the hard work and careful preparation done by Beatrice Belen and her team.